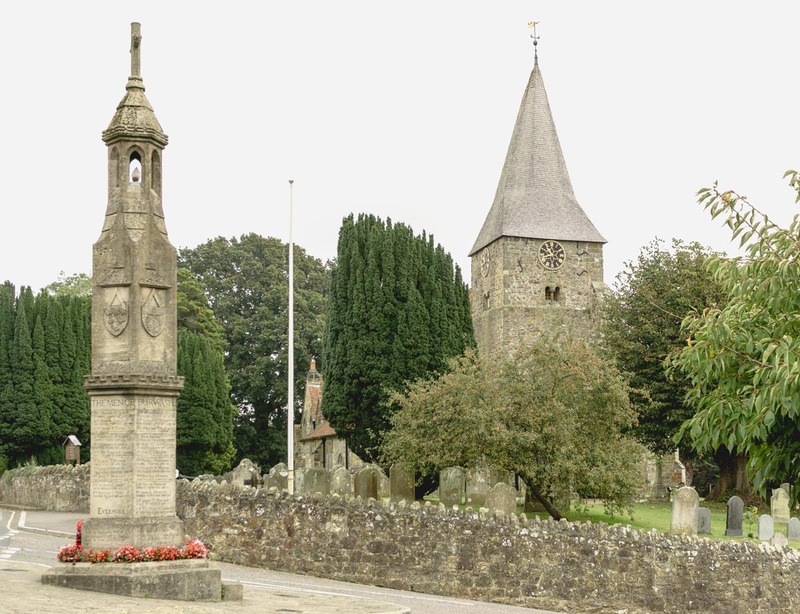 There are 14 crosses at St. Bartholomew’s Church in Burwash (although one of these is not a battlefield cross). 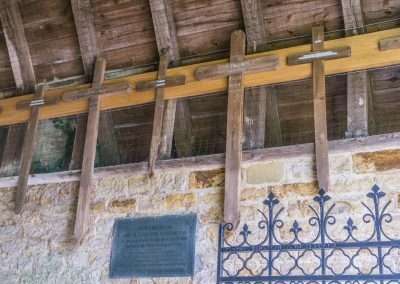 They are all located high up in the entrance porch and there are seven on each side. 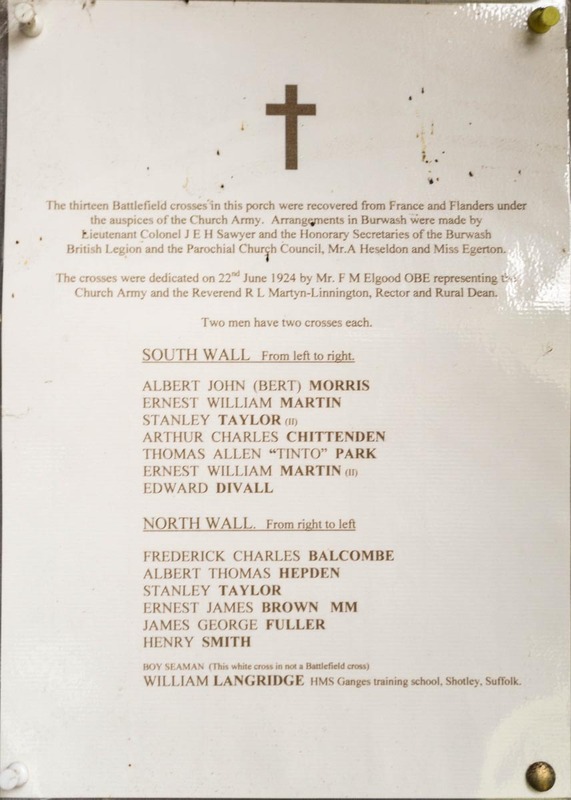 The following men are commemorated here: Albert John Morris, Ernest William Martin (2 crosses), Stanley Taylor (2 crosses), Arthur Charles Chittenden, Thomas Allen Park, Edward Divall, Frederick Charles Balcombe, Albert Thomas Hepden, Ernest James Brown, James George Fuller, Henry Smith, and William Langridge. 4 GRU tags – all illegible. This is the grave marker of Private Albert John (Bert) Morris. Text type (e.g. hand-written, GRU tags, carved): 4 GRU tags only. Shaft Height: Unable to reach. 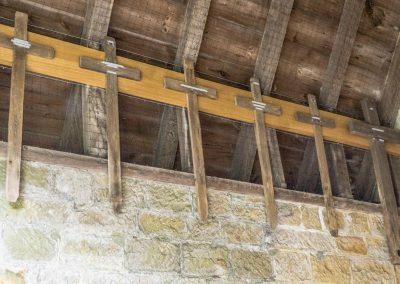 Mounting to wall: The cross is mounted upon a large horizontal piece of wood and attached by screws. Surface insertion depth (into ground if apparent): Approx 254mm in depth. 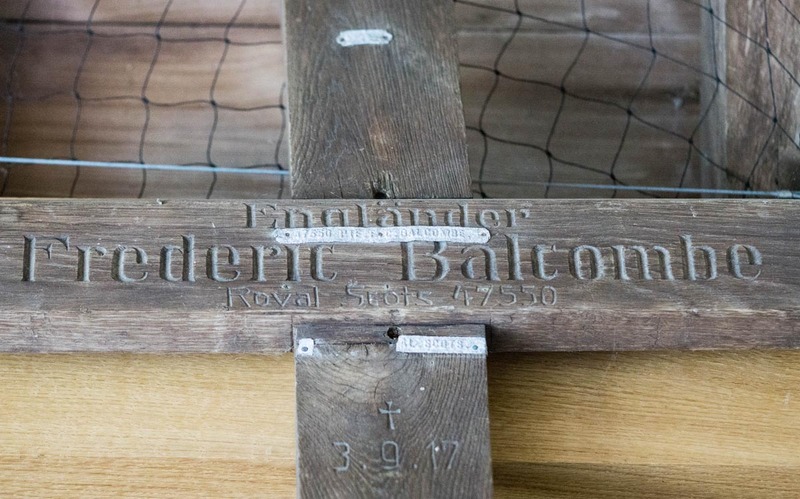 Condition (cracked, paint peeling, woodwork, damage etc): There is a white horizontal mark on the cross just above where it was inserted into the ground. There are also two small holes just above this. The cross is in good condition though overall. 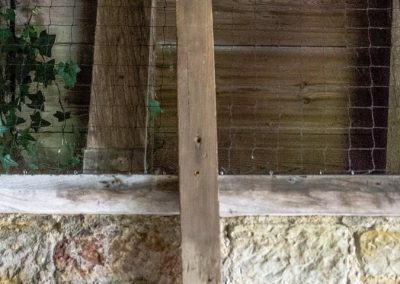 Private Albert John (Bert) Morris (G/11979 – The Buffs – East Kent Regiment, 8th Battalion) was the son of George & May Morris of Rock’s Cottage, Burwash. He was a farm worker at Mottynsden Farm and enlisted at Chichester. He was wounded in the attack near Hill 60 and died of those wounds at 8.30pm on 15th June 1917 aged 23. He is buried at Lijssenthoek Military Cemetery, Belgium (Plot XIV, Row F, Grave 18). 3 GRU tags – all illegible. This is the first grave marker of Corporal Ernest William Martin (see also grave marker number 6). 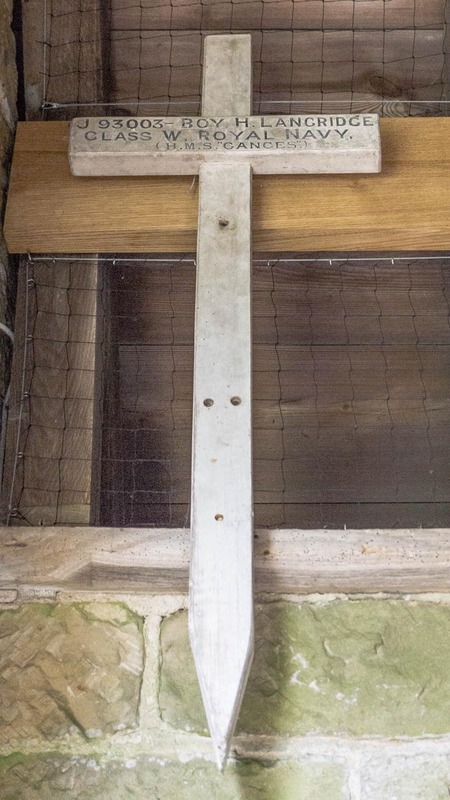 Condition (cracked, paint peeling, woodwork, damage etc): There is one small hole just below the cross member, and two more just above the insertion point into the ground. The cross is in very good condition though overall. Corporal William Martin (5/2348, Royal Sussex Regiment, 5th Battalion, ‘B’ Coy) was the son of Harold & Louisa Martin of 49 Third Cross Road, Twickenham, Middlesex. He enlisted in Hastings. He was killed in action on 14th November 1916 aged 24 at Martinpuich and was commended for gallantry on the battlefield. He is buried at Martinpuich British Cemetery, Somme, France (Row E, Grave 17). 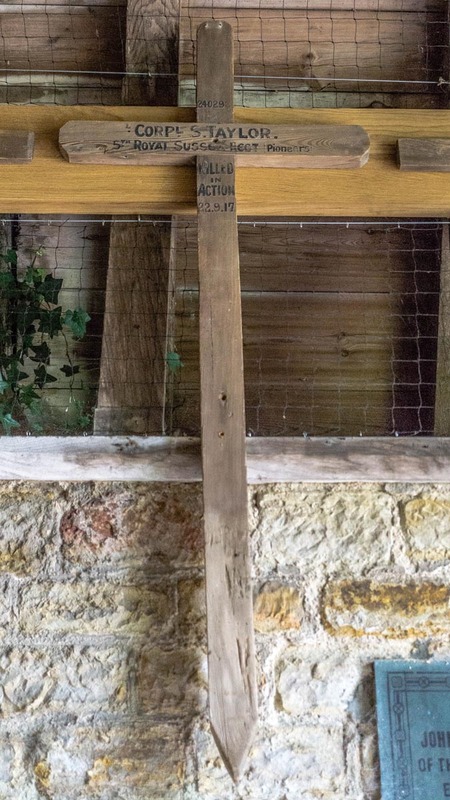 This is the first of two crosses dedicated to Ernest William Martin at St. Bartholomew’s Church, Burwash (see cross number 6). 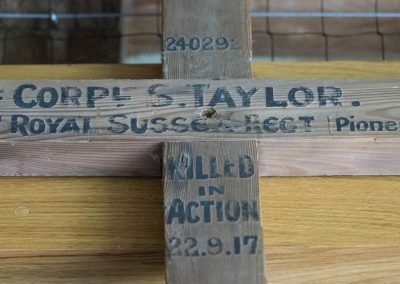 240292, L.Corpl S.Taylor, 5th Royal Sussex Regt Pioneers, killed in action 22.9.17. Evidence of use in field (earth marking, cracking, staining, shrinkage): There is some cracking and quite a bit of discolouring to the bottom of the cross where it has been inserted into the ground. Surface insertion depth (into ground if apparent): 381mm in depth. 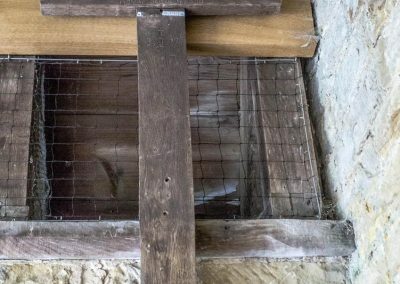 Condition (cracked, paint peeling, woodwork, damage etc): There is some cracking in places especially towards the bottom of the cross and there is also two small holes above the insertion point into the ground. Overall the cross is in good condition. 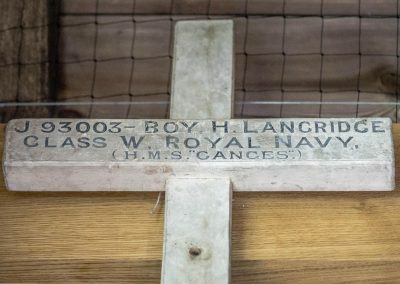 Lance Corporal Stanley Taylor was the son of George & Emma Taylor of 84 William Street, Heywood, Lancashire. He was born in Blackrod, Lancashire but enlisted at Ticehurst, East Sussex. He was killed in action on 17th September 1917 aged 22 while the battalion was engaged in operations southwest of St. Julien for the battle of the Menin Road Bridge. He is buried at Vlamertinge New Military Cemetery, Ypres, Belgium (Plot X, Row G, Grave 9). 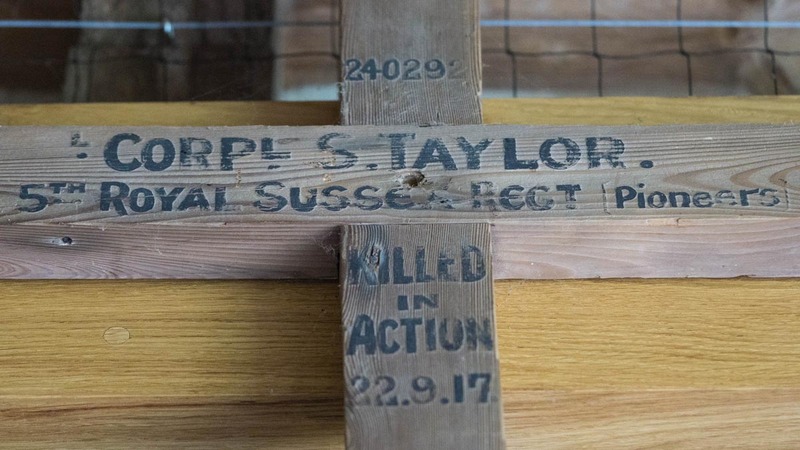 This is the first of two crosses dedicated to Stanley Taylor at St. Bartholomew’s Church, Burwash (see cross number 10). 2 GRU tags – both illegible. This is the grave marker of Lance Corporal Arthur Charles Chittenden. Evidence of use in field (earth marking, cracking, staining, shrinkage): The cross is in poor condition where it has been inserted into the ground. Surface insertion depth (into ground if apparent): Unable to reach. 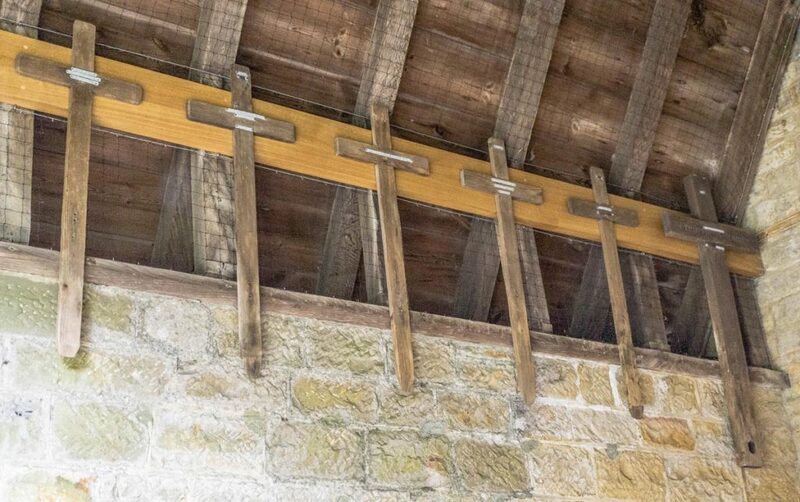 Condition (cracked, paint peeling, woodwork, damage etc): The top of the cross is in quite good condition, however the bottom is very broken and deteriorated. 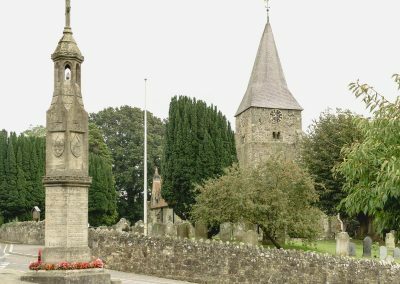 Lance Corporal Arthur Charles Chittenden (10488 Kings Shropshire Light Infantry) was the son of Thomas & Bertha Alice Chittenden of 16 Greenfield Road, Burwash. He died on 26th January 1916 aged 18. He is buried at Essex Farm Cemetery, Belgium (Plot I, Row H, Grave 7). 240738 PTE Parks.T. 5th Royal Sussex Regt, (Pioneers), killed in action 15.9.17. Text type (e.g. hand-written, GRU tags, carved): Hand painted in white text. Evidence of use in field (earth marking, cracking, staining, shrinkage): There is some discolouration where it has been inserted into the ground. 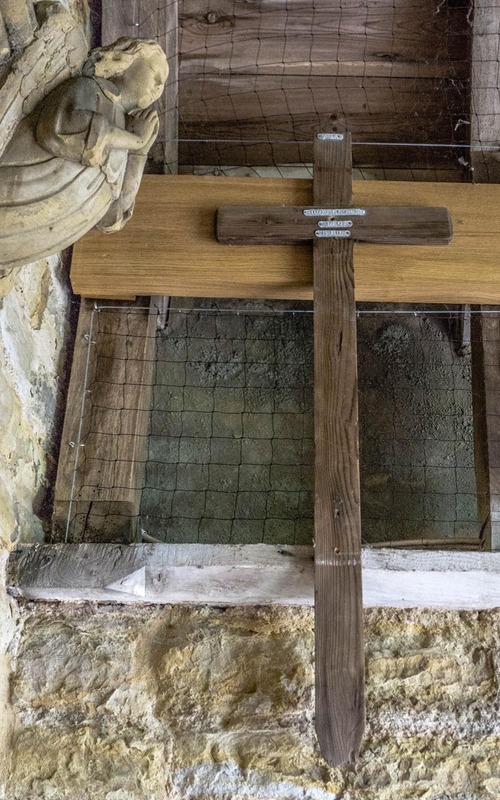 Condition (cracked, paint peeling, woodwork, damage etc): There is some discolouring to the bottom of the cross where it has been inserted into the ground. Also some cracking and there are 3 small holes in the shaft. Overall though it’s in good condition. 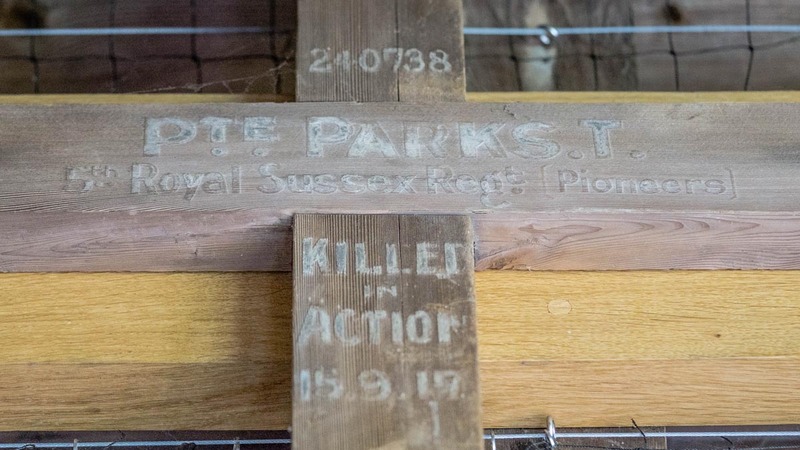 Private Thomas Allen ‘Tinto’ Park (Royal Sussex Regiment, 1st/5th Bn) was the son of Thomas Allen Park & Ann Elizabeth Park of Pay Gate, Burwash. He died on 15th September 1917 aged 21. He is buried at Vlamertinghe New Military Cemetery, Belgium (Plot XII, Row H, Grave 14). 3 tags, all illegible. This is the second grave marker of Ernest William Martin (see cross number 2). Text type (e.g. hand-written, GRU tags, carved): 3 tags only. Evidence of use in field (earth marking, cracking, staining, shrinkage): Some minor discolouring where it has been inserted into the ground. Condition (cracked, paint peeling, woodwork, damage etc): Overall the cross is in good condition. There is one small hole in the shaft. 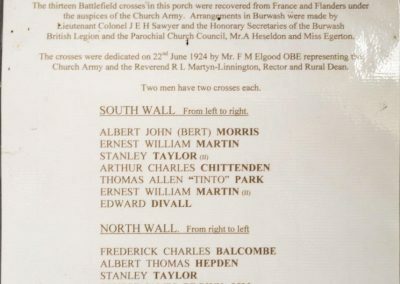 This is the second cross commemorating Ernest William Martin (see cross number 2). 4 GRU tags, all illegible. The second tag is broken. This is the grave marker of Lance Corporal Edward Divall. Evidence of use in field (earth marking, cracking, staining, shrinkage): There is some discolouring and cracking where it has been inserted into the ground. Condition (cracked, paint peeling, woodwork, damage etc): There are 5 small holes in the shaft, and some cracks/staining towards the bottom of the cross. Otherwise in good condition. Lance Corporal Edward Divall (Royal Sussex Regiment, 9th Bn was the husband of Lilian May Divall of Elphicks Cottage, Burwash. He died aged 30 years old on 4th November 1918 and is buried at Cross Roads Cemetery, Fontaine-au-Bois, France (Plot I, Row F, Grave 13). Englander, Frederic Balcombe, Royal Scots 47550, + 3.9.17. Text type (e.g. 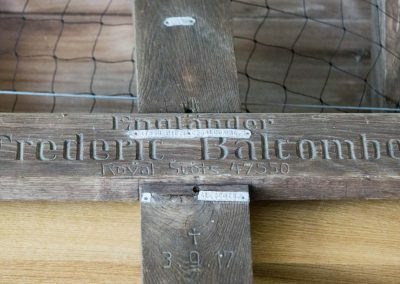 hand-written, GRU tags, carved): The text is carved into the wood. There are also 3 GRU tags, all illegible. The 3rd tag is broken. Evidence of use in field (earth marking, cracking, staining, shrinkage): There is quite a lot of discolouring where the cross has been inserted into the ground. 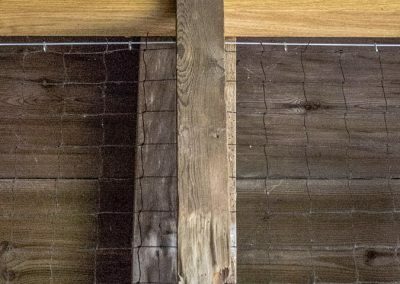 Condition (cracked, paint peeling, woodwork, damage etc): There are 2 small holes just above and below the cross member. There is also a large hole in the bottom of the cross. Overall though it’s in good condition. Private Frederick Charles Balcombe (47550 Royal Scots, 13th Bn) was the son of William & Annie Balcombe of 1 Prospect Place, Burwash. He was killed on 3rd September 1917 aged 23, and is buried at Harlebeke New British Cemetery, Belgium (Plot XII, Row D, Grave 4). 1 GRU tag which is illegible. This is the grave marker of Private Albert Thomas Hepden. Text type (e.g. hand-written, GRU tags, carved): 1 GRU tags only. 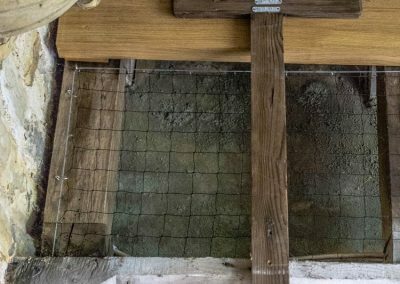 Evidence of use in field (earth marking, cracking, staining, shrinkage): There is some discolouring where the cross has been inserted into the ground. Surface insertion depth (into ground if apparent): 254mm in depth. Condition (cracked, paint peeling, woodwork, damage etc): There are 2 small holes in the shaft and some discolouring/cracking, but overall the cross is in good condition. 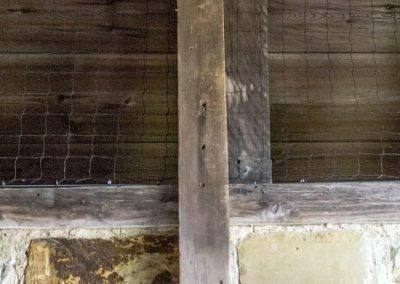 Private Albert William Hepden (58032 Worcestershire regiment 1st Bn) was the son of Mr W.Hepden of Pheobus Cottage, Burwash. He died on 14th October 1918 aged 20 and is buried at Point-du-Jour Military Cemetery, Athies, France (Plot II, Row B, Grave 6). 4 GRU tags which are all illegible. This is the second grave marker of Lieutenant Corporal Stanley Taylor. See cross number 3 for the first grave marker. Surface insertion depth (into ground if apparent): Approx 300mm in depth. 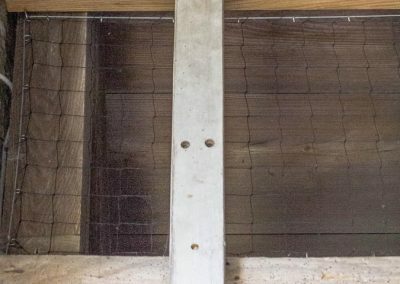 Condition (cracked, paint peeling, woodwork, damage etc): There are two small holes just above the insertion point into the ground. The cross is in good condition though overall. See details for cross number 3 for information re Corporal Stanley Taylor. 1 GRU tag which is illegible. This is the grave marker of Lance Corporal Ernest James Brown (MM). Text type (e.g. hand-written, GRU tags, carved): 1 GRU tag only. Evidence of use in field (earth marking, cracking, staining, shrinkage): There is some discolouring where it has been inserted into the ground. 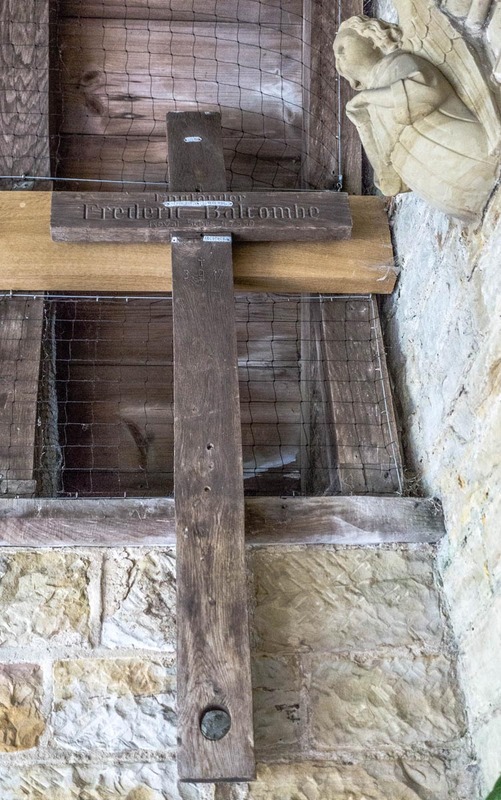 Condition (cracked, paint peeling, woodwork, damage etc): There is some discolouring towards the bottom of the cross and a small hole in the cross member. Overall though the cross is in good condition. Lance Corporal Ernest James Brown (50/1157 Royal Sussex Regiment 11th Bn was the son of William & Emily Brown of 20 Emmanuel Road, Hastings, and the husband of Annie Brown of 4 Portland Terrace, Burwash. He died on 12th October 1916 aged 28 and is buried at Hamel Military Cemetery, Beaumont-Hamel, France (Plot II, Row B, Grave 11). He was awarded the Military Cross. 4 GRU tags, all illegible. This is the grave marker of Lance Corporal James George Fuller. Evidence of use in field (earth marking, cracking, staining, shrinkage): There is some discolouring/cracking where it has been inserted into the ground. 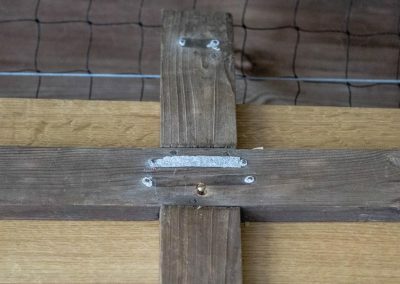 Condition (cracked, paint peeling, woodwork, damage etc): There are 2 small holes towards the bottom of the cross and some discolouring/cracking. Overall though it’s in good condition. Lance Corporal James George Fuller (L/8163 ‘The Buffs’, East Kent Regiment, 1st Bn, “B Coy”) was the son of Minnie Anne Willett (formerly Fuller) & the late James George Fuller of High St, Burwash. He died on 7th June 1915 aged 34 and is commemorated on the Menin Gate at Ypres (Panel 14). 3 GRU tags, all illegible. This is the grave marker of Private Henry Smith. 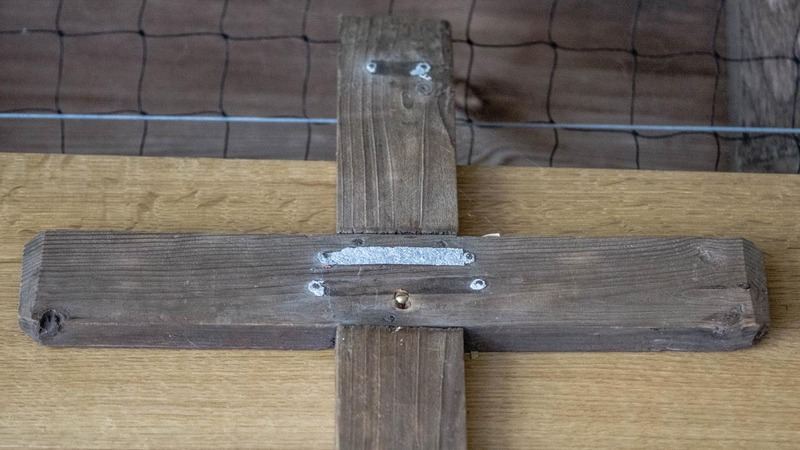 Condition (cracked, paint peeling, woodwork, damage etc): There are 3 small holes towards the bottom of the cross and some discolouring/cracking. Overall though it’s in good condition. Private Henry Smith (SD/4872, 11th Battalion, Royal Sussex Regiment) was born in Burwash but enlisted in Hastings. He was the son of Mrs Olive Smith of Burwash. He was killed in action on 3rd September 1916 aged 20. He is buried in Ancre British Cemetery, Beaumont-Hamel, Somme, France (Plot III, B.30). Finish (varnish, paint, oiled, unfinished etc): The cross has been painted white. 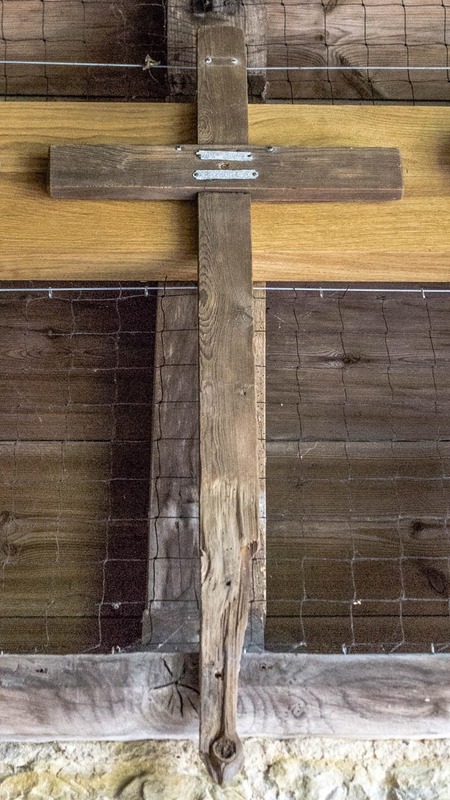 Condition (cracked, paint peeling, woodwork, damage etc): The cross is in very good condition. 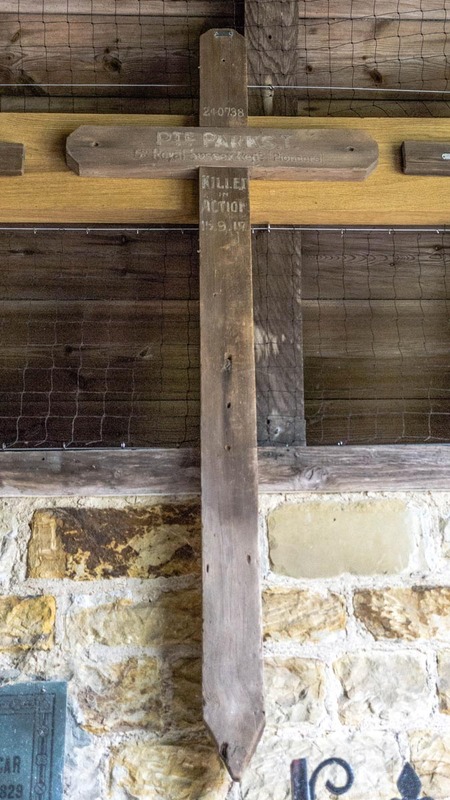 Although this is not a battlefield cross, I’ve still included it as it hangs in the porch with the other crosses. William Langridge was born on 26th December 1901 and was the son of Frederick & Eliza Langridge of 5 Portland Terrace, Burwash. He was a trainee sailor aboard HMS Ganges II, but unfortunately died on 7th November 1918 aged just 16 years old from pneumonia. He is buried in St Bartholomew churchyard. 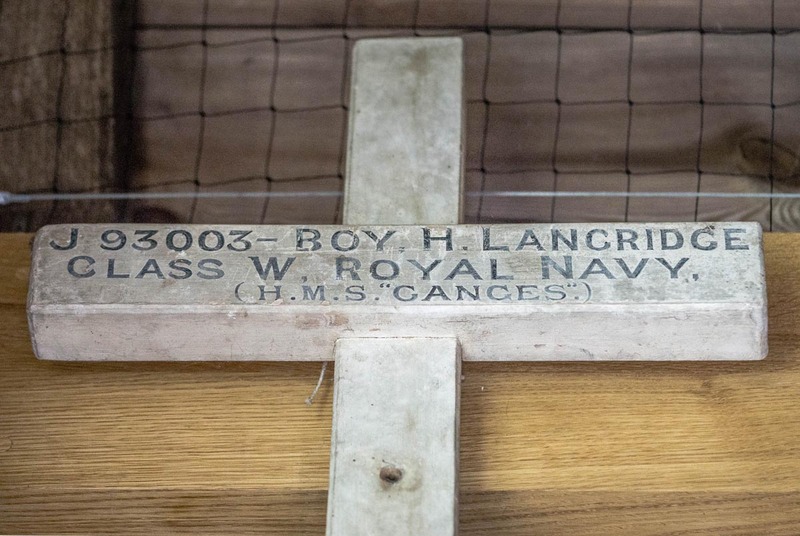 His brother Frederick also joined the Royal Navy in 1911, but survived WW1. 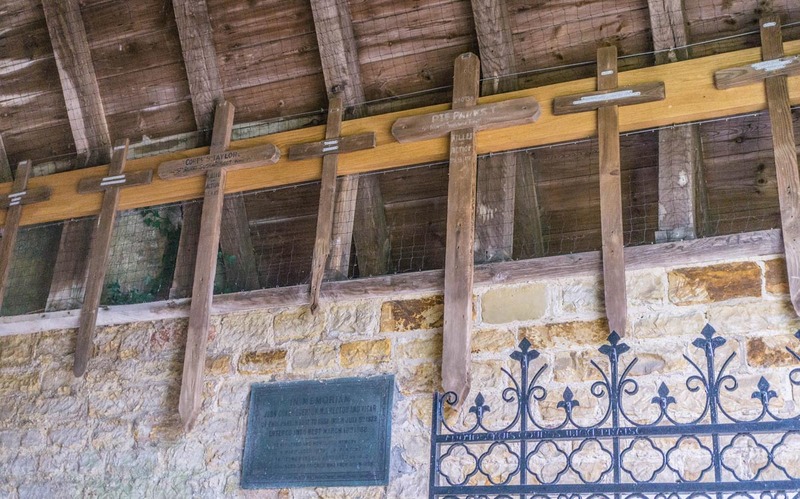 All the crosses were mounted in the porch by Frank Sanderson who I met while visiting the church. 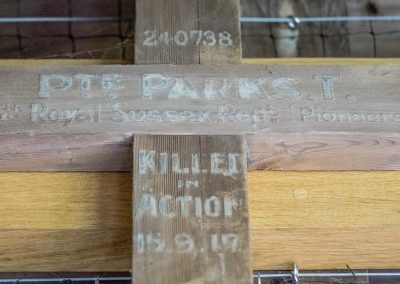 Frank has also hand made and attached new GRU tags to the back of each cross to demonstrate how they originally looked before they faded. 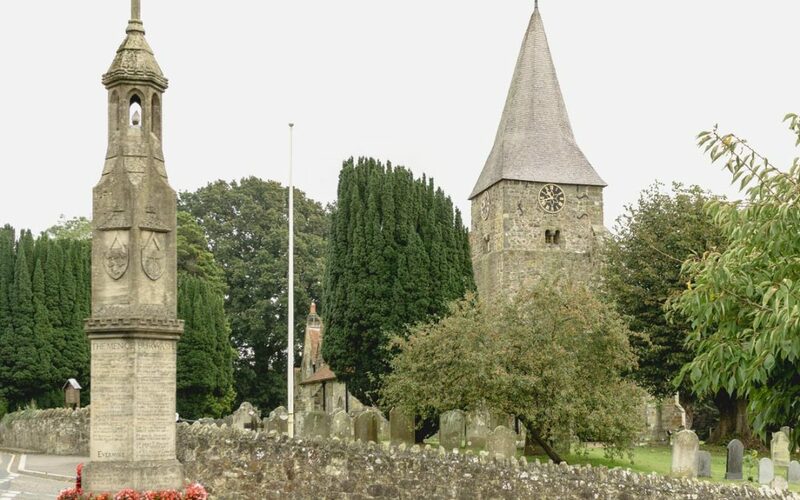 Burwash church is open to the public seven days a week.